There are seven total selection modes in Modo. • The first three (vertices, edges, and polygons) are the component selection modes. In these modes you use the pointer to select the component elements of the geometry to manipulate by using Modo's various modeling and transform tools. When in Items mode, you can transform an entire item layer as a whole (such as move, rotate, or scale the layer). Think of item layers as a container. Component edits manipulate the contents of the container, and item edits transform the container, itself. • With the last two modes, the Pivot and Center modes, you can select the center and pivot elements of an item layer. Then, you can manipulate them directly by modifying their position and orientation to the associated geometry for animation purposes. This command cycles through the component selection types for vertices, edges, and polygons. In the Modo default configuration this is mapped to the Spacebar key. If you have selected a tool previously and you then press the Spacebar, Modo drops the tool. If you have not selected a tool, the command cycles the selection sequentially from vertices to edges to polygon and back to vertices in a continuous loop. Auto Select mode allows you to quickly change the current selection mode used in your scene. From the modes toolbar, click the Auto Select icon to activate the automatic selection mode. Once activated, deselect items in your scene and select a vertex, an edge, or a polygon to automatically activate the different selection modes. For example, if Vertices selection mode is active and there are no vertices currently selected, clicking on an edge will switches to Edges selection mode automatically. A vertex is a single point that represents a position in 3D space. When in Vertices selection mode, you can use the basic paint or lasso selection functions to quickly select one or more vertices for precise editing. Modo indicates selected vertices with an orange color to distinguish them from unselected vertices. By dragging over an object, you can paint a selection of one of more vertices. If you right-click and drag, you can draw a lasso around the selection area to select multiple vertices at once. Modo provides other selection options to use with vertices such as the Loop Select and Select More/Less functions. (For information about these and other selection functions, see the Using Selection Modifiers topic.) If you wish, you can change the lasso style by choosing Select > Lasso Style and specifying a different style. You can activate Vertices selection mode by clicking the Vertices interface button in the modes toolbar. Alternatively, choose Select > Vertices, press 1, right-click away from any geometry in the 3D viewport and choose Vertices, or middle-click any vertex in the viewport. Two vertices define an edge, which itself is the line between the vertices. When in Edges selection mode, you can use the basic paint or lasso selection options to quickly select one or more edges of the geometry for precise editing. Modo indicates selected edges with an orange color to distinguish them from unselected edges. By dragging over an object, you can paint a selection of one of more edges. If you right-click and drag, you can draw a lasso around the selection area to select multiple edges at once. Modo provides other selection options to use with edges such as the Loop Select and Ring Select functions. (For information about these and other selection functions, see the Using Selection Modifiers topic.) If you wish, you can change the lasso style by choosing Select > Lasso Style and specifying a different style. You can activate Edges selection mode by clicking the Edges interface button in the modes toolbar. Alternatively, choose Select > Edges, press 2, right-click away from any geometry in the 3D viewport and choose Edges, or middle-click any edge in the viewport. A polygon is a closed plane that is created from three or more edges for a renderable surface. When in Polygons selection mode, you can use the basic paint or lasso selection options to quickly select one or more polygons of the geometry for precise editing. Modo indicates selected polygons with an orange color to distinguish them from unselected polygons. By dragging over an object, you can paint a selection of one of more polygons. If you right-click and drag, you can draw a lasso around the selection area to select multiple polygons at once. Modo provides other selection options to use with polygons such as the Loop Select and Select Connected functions. (For information about these and other selection functions, see the Using Selection Modifiers topic.) If you wish, you can change the lasso style by choosing Select > Lasso Style and specifying a different style. You can activate Polygons selection mode by clicking the Polygons interface button in the modes toolbar. Alternatively, choose Select > Polygons, press 3, right-click away from any geometry in the 3D viewport and choose Polygons, or middle-click any polygon in the viewport (except in Wireframe draw mode). An item is an individual object layer in a scene — whether it's a camera, light, locator, mesh, or other type of object. Each one is individually an item. When modeling, you work in one of the component modes (Vertex, Edge, or Polygon mode). In these modes, you modify the contents of the layer items, but while in Items mode, you can select and transform entire layers. You can only modify mesh layers in a component mode. You transform all other elements in Items mode. For more information about the modes, see the Items vs. Components topic. You set all keyframes for animation while in Items mode. Component animation is only possible by using mesh deformers. You can activate Items selection mode by deselecting the active selection mode buttons, displayed in orange, in the modes toolbar. For example, clicking on the Polygon selection button takes you into polygon selection mode as normal and that button is highlighted in orange. To return to Items mode click on the orange Polygon button to turn it off. Once done, Items selection mode is activated. Alternatively, choose Select > Items, press 5, or right-click away from any geometry in the 3D viewport and choose Items from the contextual menu. You define materials when you select specific polygons and assign a Material tag. These tags produce a Material Group Item in the Shader Tree that represents the tagged polygons for masking. Modo applies any surfacing to the geometry by using this mask. You can then activate Material selection mode to select geometry based on tag definitions. Modo indicates material selections as orange outlines surrounding the area defined by the tags. You can either use the selection to edit the geometry or adjust the surfacing within the Shader Tree. When you select a specific material tag in the 3D viewport, Modo also selects the corresponding group item in the Shader Tree to make it easier to locate a specific Shader Tree layer in a complex scene. With Material selection mode active, you can select from several polygon tag types that Modo offers. By choosing Select > Polygon Tag Type, you can specify the Materials selection mode to be based on Material, Part, or Smoothing Group polygon tags. You can activate Materials selection mode by clicking Select > Materials in the modes toolbar. Alternatively, choose Select > Items, press 4, or right-click away from any geometry in the 3D viewport and choose Materials. The center element represents the center location of an item layer. Each layer in the Items list has its own corresponding center position. Modo uses this as the origin for all Position, Scale and Rotate transforms for that layer. You can use action centers to dynamically define transform origins for modeling operations, but a center defines the origin when animating in Modo. By default, the center is at the World Position origin of 0,0,0 for any item layer. You can activate Centers mode and select the center element by clicking the center icon. You can then use the Move and Rotate transform tools to reposition the center in relation to the geometry without affecting the geometry's position, itself. You can activate center selection mode by clicking the Center Selection icon in the modes toolbar. Alternatively, choose Select > Center, press 7, or right-click away from any geometry in the 3D viewport and choose Centers. A pivot is a secondary center-like element that is offset from the center. Typically, the pivot and center positions coincide for any layer. If you modify the pivot's position, then that pivot postion becomes the animation origin and overrides the center position. Modo differentiates pivots from centers in that you can use a keyframe to animate (or rotate) a pivot position. You cannot animate (nor rotate) a center. You can activate Pivot selection mode by clicking the Pivot Selection icon in the modes toolbar. Alternatively, choose Select > Pivot, press 6, or right-click away from any geometry in the 3D viewport and choose Pivots. Beyond directly selecting elements, with all selection modes you implicitly select vertices, polygons, and edges. For example, when you select a polygon, Modo also implicitly selects the vertices that make up that polygon. In this way you can select a polygon and still apply the Vertex Bevel tool, for example, and the vertices in that polygon are the active mesh elements for that tool. The vertices do not appear as selected in the viewport, but, nonetheless, you can perform vertex operations on them. In all modes, if you don't select anything directly, Modo implicitly selects all vertices, polygons, or edges. When you select several polygons in Polygon mode and then use an edge tool, Modo applies the action to all the edges around the polygon group. This contour edge is a simple, one-step method for selecting certain types of edge loops. By pressing the Alt key, you can convert implicit selections to direct selections. For example, if you have selected 3 polygons, pressing the Alt key as you click the Polygon button in the modes toolbar changes the viewport selection to edges. Doing the same for an Edge selection converts the selection to vertices. Pressing Ctrl changes the Edge button to a Boundary button for you to convert existing polygon selections to boundary-edge selections. You can paint geometry selections by clicking elements in 3D view. Click away from any geometry first to deselect everything. Then drag to have Modo select all elements under the pointer as you move the pointer on the screen. In this manner, you can quickly "paint" a selection by dragging over a desired component. Press the Shift key as you select current selection mode elements to add them to the selection. You can either Shift-click single elements or Shift-drag across multiple elements to add multiple elements. Ctrl-click removes items from the selection. You can select geometry in 3D view by right-clicking and dragging to enclose the geometry within a lasso. Geometry must be fully enclosed in the lasso to be selected. In Shaded mode, selecting with the lasso uses a backface cull, and, therefore, Modo does not select polygons, edges, or vertices facing away from the view plane. If you middle-click and drag, Modo selects through the geometry to make selections on the backside as well. This is reversed in Wireframe mode: using the lasso selects through the mesh, but using the middle-click and drag implements the backface cull to select only facing geometry. • Press the Shift key as you continue using the lasso selection. Modo adds the new selection to the original selection. • Press Ctrl as you continue using the lasso selection. Modo removes the newly selected geometry from the existing selection. 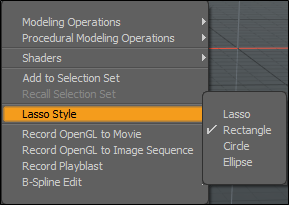 Lasso Stylespecifies the shape of the lasso selection. The style defaults to a regular, freeform lasso, but you can specify Rectangle, Circle, or Ellipse. • Click Select > Lasso Type and specifying an alternate style. • Alternatively, right-click in the 3D viewport, select Lasso Style from the contextual menu, and select an alternate style. Lazy Selection allows you to select elements by clicking in their proximity, rather than clicking on the elements precisely. When you enable this option in any selection mode, you can click anywhere on your mesh, and the nearby elements get selected. Click and drag in an area to select all nearby elements. Click the Lazy Select button to activate it. Shortest Path selection finds the shortest path between two elements on a continuous mesh. It works with vertices, edges, and polygons, and with Symmetry. You can use this as a selection mode for paint selection, or a stand-alone command. To activate Shortest Path Mode, in the menu bar, click Select > Shortest Path Mode. Alternatively, in the Modo layout, go to the Model toolbar on the left, click the Select tab, and enable Shortest Path. Now if you select an element in the 3D viewport, and move the cursor, the shortest path between the selected element and the current element is highlighted. With an element selected, hold Shift and click another element to select it along with the shortest path between the two elements. 1. Select two elements by holding the Shift key and clicking in the viewport. 2. In the Modo layout, go to the Model toolbar on the left, click the Select tab, and click the Shortest Path button. This displays a dialog where you have to specify the Space you're working in. 3. Select Model3D for 3D meshes, or UV if you're working with a UV map, and click OK. This selects the elements on the shortest path between the two original elements. To deselect (or clear) the current selection, click anywhere in a 3D viewport, press the Spacebar, or press the Esc key. If you click another element of the current selection mode, Modo clears the original selection and selects the element you clicked. Making selections is an undo-able action. You can easily undo a selection state if you accidentally clear a selection. When nothing is selected, Modo considers everything active for the tool and command functions. This makes dropping selection a quick way to select everything.